OS Explorer Map 145, 'Guildford & Farnham'. GPS Co-ordinates: N51 21' 90" W000 46' 80"
To see: the village of Shere. This very shallow ford over the Tilling Bourne has a concrete bottom and is seldom very deep, even after very wet periods. Worth a visit if you're passing but I certainly wouldn't go out of my way to drive it. 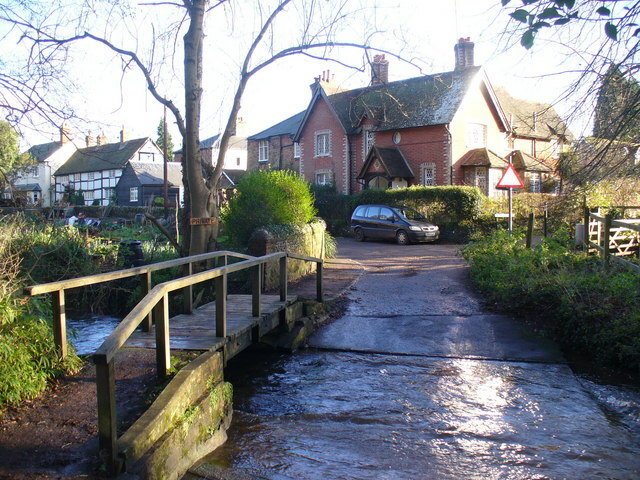 Why not break for lunch in the picturesque village of Shere? This bit of Rectory Lane is TRO's: no motor vehicles except for access. See http://g.co/maps/8x66u for the sign at the top: I think the other end is well beyond the ford (Google Streetview didn't even bother with the unrestricted bit). I take your point about the signs at the top of Rectory Lane, but I can't seem to see any on Lower Street, which is where we visited this ford from (admittedly on foot). The only signs at that end are 'Ford', and on the reverse, 'Try You Brakes' (I may well have just not seen any others). So therefore, I'm not saying you're wrong but just that I'm unsure. Probably best to assume it is subject to a TRO to be safe. Thanks for the input though, it's appreciated!